We are a Bristol based company primarily covering Bristol, Bath, Avonmouth, Portishead, Clevedon, Thornbury, Yate and Chippenham. Why waste time going to a garage, when Slade Auto Electrical can bring the full range of vehicle services to your home or workplace. We now offer the latest R1234yf re-gas service for 2015 vehicles onwards. Please enquire for prices. Slade Auto Electrical work with both the motor trade and public. We service all types of motor vehicles, any manufacturer or model, from classic and vintage cars to the very latest. No Job is too large or too small. Mobile Call Out Service. 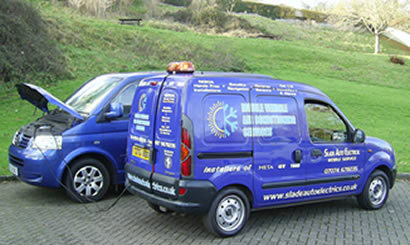 Our vehicles are fully equipped to come to your home or workplace to carry out repairs or instalations. Slade Auto Electrical will fit any electrical accessory; in-car entertainment, SatNav, reversing sensors, hands free mobile phone installations or lighting upgrades. Our labour rates are extremely competitive. With over 20 years experience in the motor trade and many satisfied customers you can be assured of a first rate service. Please visit our services page to view the our range of products and services. From the 27th February 2007 any drivers caught using their mobile phone will face increased penalties. The Road Safety Act now carries a tougher fixed penalty of three points on your licence as well as a £60 fine. To keep yourself legal, a hands free car kit will have to be used. If your phone is Bluetooth compatible, and most are nowadays, a cost effective way to get hands free in your car is with a Parrot or Nokia car kit. We can also fit telephone holders and damage free mounts. We are specialists in Air Conditioning, Car Alarms, in car entertainment, Hands Free Kits, Reverse Sensors, electric window fitting & Auto Electrical Repairs with a Mobile Call Out Service.